Suppose that you just started investing and wanted to build an investment portfolio that would increase the long-term benefits while reducing the risk, what’s the first thing that come up in your mind? Is it what particular stocks/mutual funds/ETFs you want to buy so that you can have the maximum return you could have with those investments? Or is it a blueprint of how you want to invest your money? My answer to this question is: I want to have a clear plan on how I want to invest before getting into the details of selecting exactly what I want to invest. And my answer to “how I want to invest” question is asset allocation. Well, that’s my answer know. Before going into the discussion of asset allocation and its importance, I have to admit that when I first started, I didn’t really have a good grasp of the concept of asset allocation. I actually bought a mutual fund as my first investment before beginning to educate myself on how to invest. an investment strategy that aims to balance risk and reward by apportioning a portfolio’s assets according to an individual’s goals, risk tolerance and investment horizon. So essentially, asset allocation is a method to mix different asset classes (such as equities, fixed income, and cash) in the portfolio such that it will help the investor to achieve his or her investment goal by balancing the risk and reward, i.e., maximum long-term return of the investments while reducing the risk to the minimum. As the above definition indicates, an asset allocation plan is not something that you come up randomly. Instead, to achieve your goal, you will need to create a plan based on your investment goal (what you want to achieve), your risk tolerance level (how much risk you are willing to take), and your time horizon (when you need to use the money). Since all these three factors change over time, the allocation of assets within your investment plan also evolves to reflect these changes. Now we know what asset allocation is, let’s take a look what role asset allocation plays in your long-term investment plan. The following is a chart that I drew based on the Efficient Frontier theory. What Efficient Frontier theory argues is that an investment portfolio can be optimized, as long as all asset classes are included and properly weighted. As we all know, in order to receive a higher return, a higher risk must be taken. Among all the asset classes, equities historically provide investors with the highest returns over the long-term, but stocks also incur the highest risk (look at the stock markets now). To achieve the balance between risk and reward, you will need to have more than just stocks in your portfolio. 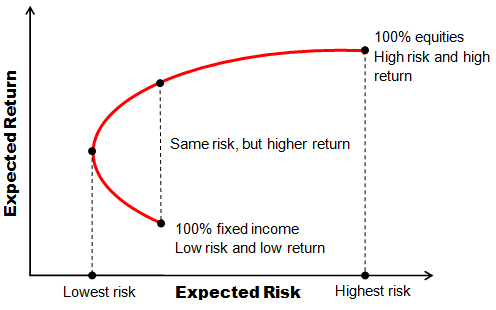 In the above picture, the red line is the efficient frontier curve, which shows the optimal return-risk relationship. That is, points on the curve represents portfolios whose returns are optimized for their corresponding risk levels. Portfolios below the curve are taking unnecessary high risk with no improved returns (high risk, low return), while portfolios above the curve are impossible to achieve at the corresponding risk levels (high return, low risk). Another interesting observation is that by properly allocating different asset classes (a point on the curve), you can expect a higher return without taking extra risk. This’s why asset allocation is important. How to Choose the Right Asset Allocation? OK, here comes the most difficult part. Why it is difficult? Because, unlike the above concepts, there is no clear answer on how much you should invest in each asset class. It’s a personal decision that largely depends on your own investment goal, time frame, and risk tolerance level. But there are some general guidelines you can follow. As an example, let’s assume that you are young and have something like 20 or 30 years to retirement and assume that you are investing for a comfortable retirement. Then in this case, you can afford to put a large portion of your investments in risky assets such as stocks because you will still have enough time to wait for the stock market to recover even if it crashes today (look what happened in 2008 and 2009 and where the markets are today). On the other hand, if you are near or already in retirement, or if you just want to invest for a short-term goal (such as buy a house in 5 years), then you may want to be conservative with your money because of the volatility of the stock market. In the latter case, preserving your investment is more important than seeking a higher return. As you can see all of the above allocations at least 85% of overall assets in stocks because there are still more than 15 years way from retirement (the age 46 – 50 group), which is a pretty good time horizon. With such a long time, you can afford to invest more in equities than bonds in order to get a better return. As we get old, the portion that gets invested in stocks gets smaller, mainly because our risk tolerance becomes weaker. There’s no definitive answer on what the optimal asset allocation is, but you still can have a pretty good idea by taking a look at how the so-called lifecycle funds, or target-date funds, invest their money based on a targeted retirement year. The managers of lifecycle funds are responsible to adjust the fund’s asset allocation as the fund moves close to the target date. By looking at asset allocations at different funds that have a similar time frame as yours, you can have an idea on making up your own plan. I have discussed this topic a while ago when I looked at lifecycle funds from Vanguard, Fidelity, and T. Rowe Price. 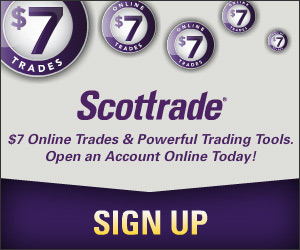 Great info thanks.This site actually helped me shave money off my current debt and allowed me to turn around and re-invest it into my portfolio. CheckingFinder is now offering a limited time offer of a trial membership to Dave Ramsey’s MyTotalMoneyMakeover.com (Renown Personal Finance Advisor) for every person who submits an application. I work with people that struggle with personal debt on an ongoing basis. Any particular pointers for asset allocation for someone who has debt and possibly job insecurity? Any money that they are thinking about allocating to investments should instead be used to pay down their debt. A perfect allocation won’t be worth a damn to them if they lose their job and are still in debt trouble. Exclusive content to say the least. Asset allocation is sort of a process that spreads your investments among different asset classes: stocks, bonds, and short-term investments etc. Since different asset classes react to changing market conditions in different ways, appropriate asset allocation can help us maintain confidence through economic ups and downs and even increase one’s potential for better returns over time. Keep in mind that neither diversification nor asset allocation ensures a profit or guarantees against loss. I am surely going to bookmark this article for future reference and would show my friends. This is a very nicely written article. Clear and concise. On my way to financial independence I not only allocating between stocks and bonds, but also currencies, real estate and precious metals. time to be happy. I’ve read this post and if I could I desire to suggest you few interesting things or advice. Perhaps you could write next articles referring to this article. I want to read more things about it!